Source: ‘Movies “Over the Waves” at Lumina, Wrightsville Beach, Wilmington, N.C.’ in Durwood Barbour Collection of North Carolina Postcards (P077), North Carolina Collection Photographic Archives, Wilson Library, UNC-Chapel Hill. Postmarked 22 July 1926. 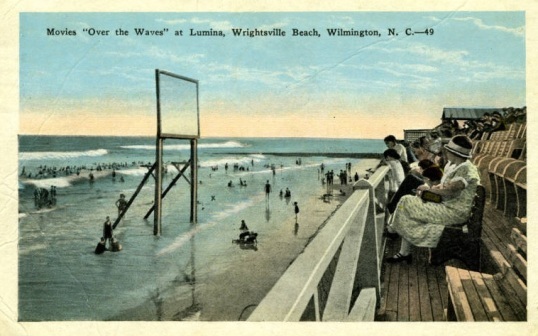 Comments: The postcard shows a cinema screen positioned at Wrightsville Beach, Wilmington, North Carolina, with seats along the shoreline for the audience. The screen was an extension of the Lumina Theatre entertainment centre. The message on the back of the postcard reads: “Well Beulah how are you. I am just fine only rather warm for it sure is hot here. Wish you could have been with us yesterday you would have had a time. We [went] to the Ocean. I was in bathing right by the post in the picture. 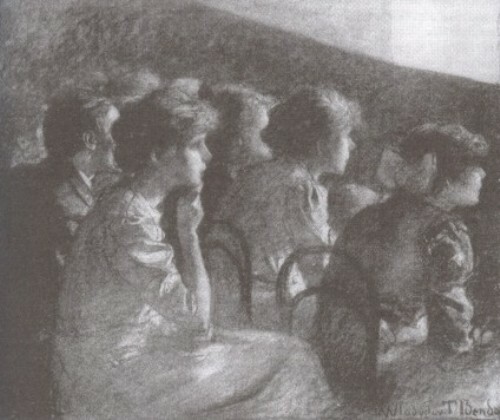 Fondly, Violet.” The image is used as a key identifier for the exceptional Going to the Show website, which documents the experience of movies and moviegoing in North Carolina, from the introduction of projected motion pictures to the end of the silent film era. This entry was posted in 1920s, Postcards, USA and tagged Audiences, Beach cinemas, Open air, Screens, Seating, Wilmington. Bookmark the permalink.